Hello, my name is Kelli and I have a scones problem. The problem is that I LOVE them so much, and can never make enough of them. 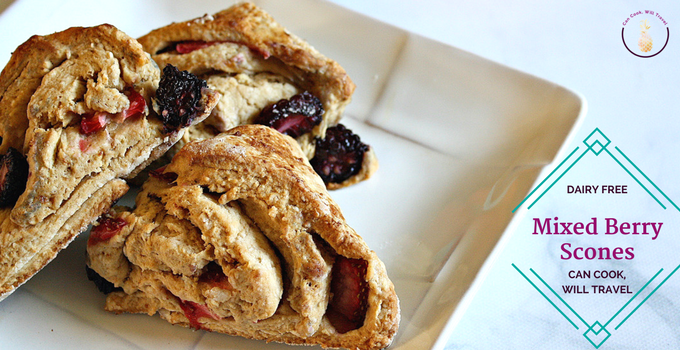 And boy this week I really wanted to do some baking, so these Mixed Berry Scones were the perfect recipe to feature! Here’s the thing: it’s flipping cold here in the Midwest. When I went home for Easter this weekend, we got 4-5 inches of snow – on freaking Easter?! I’m pretty sure every time I looked out the window, I said: This is stupid. It’s warmed up a little since, but now we have more snow in our forecast. So in an effort to stay warm, I was channeling my mom and wanting to turn on the oven to help heat the house. And baking is so fun, so off I went. I’m pretty sure no one else in my life has a love for scones like I do, but perhaps that’s because it’s a tad unnatural. But that didn’t stop me from whipping up Mixed Berry Scones this week. I had an idea of what I wanted to do but had to improvise when the stores didn’t carry what I wanted. And since strawberries and blackberries were crazy on sale and looked gorgeous, I decided Mixed Berry Scones were on the menu. I had a few ideas though of things I needed with these scones, so I was off to experiment. I wanted to use the same technique I did with the blueberry scones I made years ago. I wanted my scones to be dairy free, so substitutions were in order. They also needed to be free of refined sugar, so I was about to see how well coconut sugar worked in place of granular sugar. These Mixed Berry Scones became a hybrid of my blueberry scones and cranberry scones I’ve made in the past. Because I knew I could make the cranberry scones dough work for my dairy free and refined sugar needs. But I also wanted to use the technique from the blueberry scones, because it works SO well with fresh fruit. 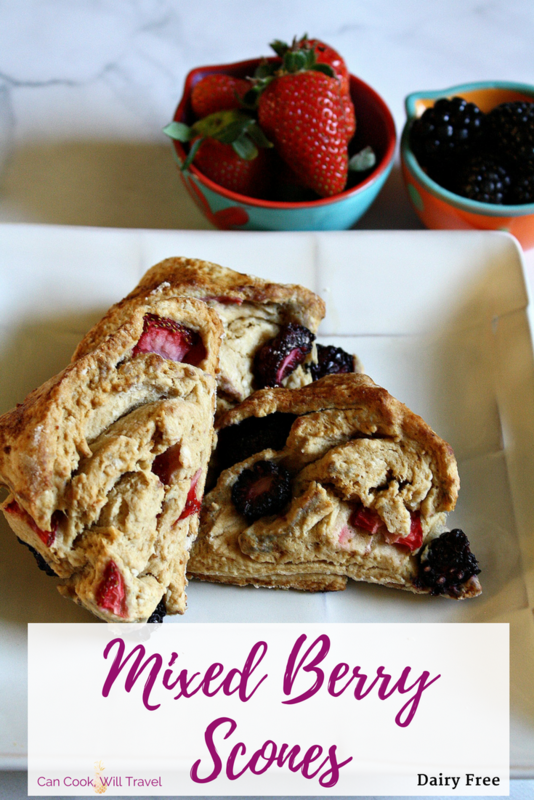 Holy perfection, Batman, this Mixed Berry Scones recipe is the BOMB! First off, all my substitutions worked out. I used coconut sugar which gave a caramelized flavor that isn’t uber sweet, which I love. And then I used vegan butter and canned coconut milk in place of butter and half and half. I’m thinking you really could do this with any berries you like, so go for it! 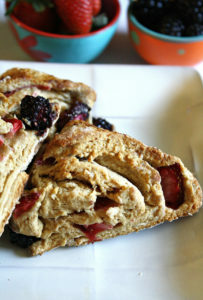 The dough basically gets rolled like a cinnamon roll around the fresh berries, so they are mixed throughout the scone and don’t get crushed and bleed into the dough. Let’s talk about this flaky pastry, shall we?! First off, I was a little nervous it was too tender and wasn’t going to work. But that’s kinda the best thing about scones is they are VERY forgiving. I kneaded it and then rolled it into a 12×12-inch square. Then it gets folded in on itself, and chilled in the freezer so it can be rolled out one more time. This method makes the pastry flaky without being dry. With each bite into the Mixed Berry Scones, the fresh fruit juices burst and add a slightly tart bite. This both adds interest to the treat and also balances out any sweet notes too. The coconut sugar, again, isn’t super sweet, but it does make the dough a little darker, which I really loved. Before baking the scones, I brushed coconut milk over them, and then sprinkled them with coconut sugar. And definitely be sure you use canned coconut milk here, because it’s better to bake with. These Mixed Berry Scones are gorgeous with their red and dark purple hues that totally make your mouth water. I’m counting down the minutes until I can have another one with a cup of Earl Grey, because yum! 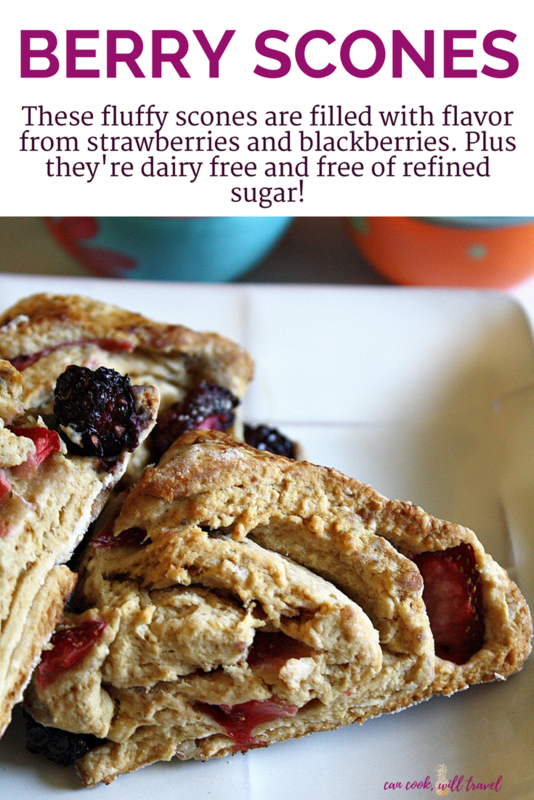 I can’t wait for you to try this Mixed Berry Scones recipe, too, so click away for the step by step photos and full recipe. Have a feeling you’ll be in pastry heaven in no time, so happy baking! One year ago: Herb Filled Popovers are oh-so-good! Four years ago: Cauliflower and Parsnip Soup = Healthy, Guilt-Free Meal! Seven years ago: The Life and Times of the Biggest Butternut Squash Ever. . .